TONY: Hey I just wanted to say thank you for letting me bring my friend Bruce in to meet everyone. TONY: I know this is going to make me sound like a terrible person, but sometimes I’m a little embarrassed to hang out with him because people tend to get the wrong idea about me when I’m around him. 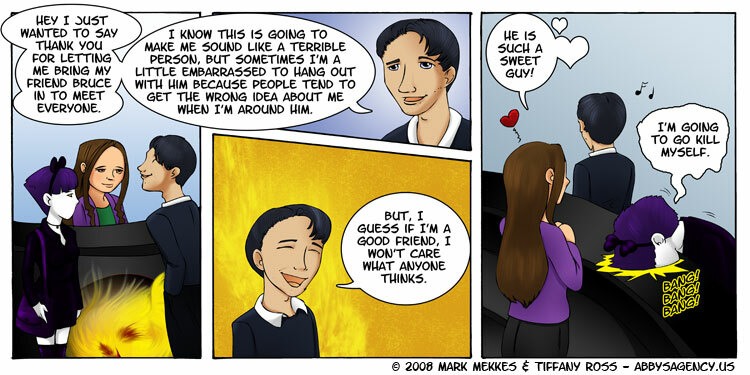 TONY: But, I guess if I’m a good friend, I won’t care what anyone thinks. ABBY: He is such a sweet guy! PLAGUE: I’m going to go kill myself. Heh, nice retwist of a twist. Very bloke type issue when ‘gay’ friends are so ‘out there cliche’…. always worried that the wrong impression is given to others. This almost makes me feel sorry for Plague, she’s batting a thousand in the miss the clue series. Looks like Plague has learned to be herself. She looks much better in darker colors. It didn’t help that he paused before saying… friend.